The Dell XPS Tower is a sleek, unassuming gaming PC that offers strong performance and a painlessly upgradable chassis. The Dell XPS Tower (starting at $1,099; $1,249 as tested) is proof that a desktop can deliver great gaming performance without looking like something that was carved out of a spaceship. Though its appearance isn’t beastly, this PC’s Intel Core i5-6400 processor and Nvidia GTX 1070 GPU give it plenty of power for playing new games at gorgeous settings and churning out immersive virtual reality experiences. Add in a painlessly upgradable chassis, and you’ve got one of the best values for gamers who like their desktops simple-looking and easy to use. 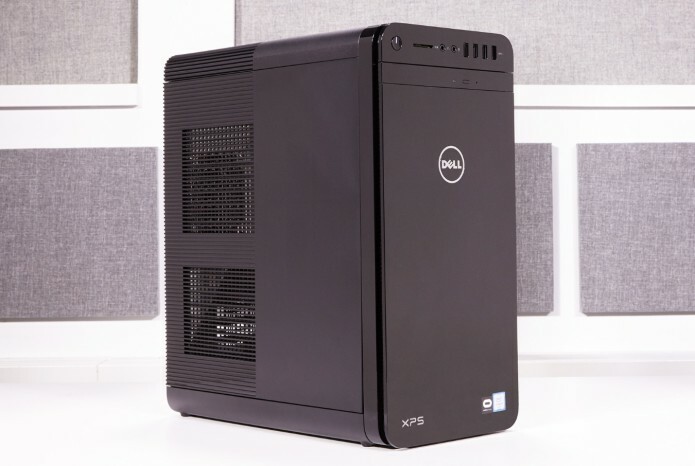 With a slick, unassuming chassis, the Dell XPS Tower looks like it belongs in an office building rather than a gaming den. Still, it might be just the thing for folks tired of the beaming lights and harsh angles of most modern gaming desktops, and its curved edges and glossy front panel make its simple design look sophisticated. Our review unit came in all black, though the latest XPS Tower Special Editions come in a more eye-catching aluminum finish. At 15.22 x 14.02 x 7.09 inches, the XPS Tower doesn’t demand a ton of room. It’s sleeker and more symmetrical than its XPS 8900 predecessor and smaller than similarly minded desktops such as the Alienware Aurora and the Lenovo Ideacentre Y700. The XPS Tower is also about 10 pounds lighter than the latter two desktops, weighing in at 22 pounds. The XPS’ port selection is as convenient as they come, with four USB 3.0 ports, an SD card reader, and headphone and mic jacks right up front. You’ll find everything else you need in the back, including two USB 2.0 ports, three USB 3.0 ports, a USB 3.1 port and a USB 3.1 Type-C connection. Two of the system’s rear USB ports are conveniently labeled with the Oculus logo so that you know where to plug in your Rift. Other essentials include an Ethernet jack and a series of 5.1 channel audio ports. The system’s Nvidia GTX 1070 graphics card sports its usual HDMI port and three DisplayPorts, giving you plenty of options for connecting to your monitors of choice. The XPS Tower is a breeze to pop open and upgrade, which is something I’ve come to expect from Dell and Alienware PCs. After flipping two lock switches, you can simply pull a lever in the back to make the side panel pop right off. Once I got inside, I was thrilled to see that the XPS borrows the Alienware Aurora’s rotating internal chamber, which essentially lets you upgrade virtually every major component without any tools. The PC’s power supply is basically a swinging door that keeps the GPU in place, which means that when you open it up, you can take the graphics card out of its slot without busting out a screwdriver. There are also several hot-swappable storage bays, and opening the power-supply door gives you easy access to the motherboard’s RAM slots. As with the Aurora, the XPS Tower is one of the few “tool-free” upgradable PCs that truly live up to the name. Packing Nvidia’s new GeForce GTX 1070 graphics card, the XPS Tower is well equipped for playing the latest games at jaw-dropping settings. The PC ran Battlefield 1 on Ultra settings at 2560 x 1440, allowing me to get fully immersed as my fellow soldiers and I stormed an enemy stronghold in Italy at a crisp 60 frames per second. The game even ran in 4K on Dell’s machine — which caused me to stop and admire the leather textures on my character’s glove — though I had to settle for 30 fps. Dell’s PC continued to impress while running the similarly demanding Rise of the Tomb Raider on Very High settings, breezing through the game’s benchmark at 73.3 fps at 1080p and a solid 43.4 fps at 2560 x 1440. It did eventually falter at 4K with graphics maxed out, turning in a just-less-than-playable 26.6 fps. The XPS Tower scored a 3,998 on the 3DMark Fire Strike Ultra test, which is designed to test 4K performance. That tops our GTX 1070-powered Lenovo Ideacentre Y700 (3,123), as well as our Asus ROG G20CB (2,153), which runs the last-generation GTX 970 card. Dell’s desktop is a certified VR machine, and not just because of the Oculus logo stamped on it. On the SteamVR performance test, the XPS Tower scored a 10.7, which Valve considers more than high enough for high-end virtual reality. To put that number into perspective, the highest SteamVR score we’ve seen yet is 11, from several GTX 1080 machines. Older-gen 970 desktops typically score closer to 6. The XPS Tower doesn’t just look like a productivity-minded desktop; thanks to its Intel Core i5-6400 processor and 8GB of RAM, it acts the part, too. The PC endured every combination of system-stressing tasks I threw at it, even as I bounced between emails, Google Docs and multiple Twitch streams while downloading games and performing a full system scan. Dell’s PC scored a 10,918 on the Geekbench 3 overall performance test, performing comparably to other Core i5 machines such as our Lenovo Y700 (10,788) and Asus G20CB (10,979) while lagging behind our 13,728 gaming-desktop average. Because it lacks a solid-state drive, the XPS Tower’s performance on our file-transfer test wasn’t exactly stellar. The PC’s 1TB, 7,200-rpm hard drive copied about 5GB of files at a rate of 52.46 MBps, which is significantly slower than the Y700’s 128GB SSD (110.6 MBps) and the Asus G20’s 256GB SSD (171.3 MBps). The XPS Tower comes with a standard-issue keyboard and mouse, which are serviceable but not completely ideal for hard-core gaming. Aside from some handy volume controls, Dell’s keyboard is as no-frills as it gets. The keys felt a little too stiff and resistant for my liking; although I was able to get through a typing test at 107 words per minute with near-perfect accuracy, I didn’t feel very comfortable doing so. The XPS tower is one of the few tool-free, upgradable PCs that truly live up to the name. Dell is likely betting that gamers will bring their own mechanical keyboards and feature-laden mice to battle, but at the very least, the company’s mouse will get the job done. It features a thumb button on each side for performing extra actions, as well as a DPI switch that uses a neat LED strip to show what sensitivity setting you’re on. The XPS Tower Special Edition starts at $1,099, which gets you an Intel Core i5-6400 processor; 8GB of RAM; a 1TB, 7,200-rpm hard drive; and a GTX 970 graphics card. We reviewed a $1,249 version of this configuration, which swaps in Nvidia’s newer GTX 1070. The $1,499 model features an Intel Core i7-6700 CPU; 16GB of RAM; and a 2TB, 7,200-rpm hard drive, while the $1,799 version will get you a Core i7-6700K processor and a 32GB SSD on top of the hard drive. The highest-end $2,049 model ups the storage to a 512GB SSD with a 2TB hard drive. All versions start with a GTX 970 graphics card but can be upgraded to a GTX 1070 for the first three models and a GTX 1080 for the priciest one. That brings me to one of my few gripes with the XPS Tower: Its configuration options are pretty limited. Aside from the GPU, you can’t add better components to any existing models. So if you wanted to configure the starting $1,099 config with an SSD, for example, you’d be out of luck. The desktop’s easy upgradability means that it won’t be a hassle to buy and install new parts separately, but it would be nice to be able to pick the parts you want right out of the box. The XPS Tower isn’t quite bloated with extra software, but it’s not as squeaky-clean as I’d like it to be. Dell’s customer service and software update apps are to expected, as is the sound-tweaking Dell Audio app. You get CyberLink’s usual suite of media player and disc-burning apps (I’m not sure who uses these things, but they show up on tons of PCs), as well as preloaded versions of apps such as Netflix and Dropbox. The PC’s Start menu includes a link to download the Oculus app, which makes sense given that the XPS Tower is designed as a VR machine. What doesn’t make sense, however, is how FarmVille 2: Country Escape snuck onto the hard drive before it shipped. In a crowded field of loud gaming desktops loaded with LEDs, the XPS Tower is downright refreshing. This is a gaming machine for folks normally turned off by gaming machines, as its sleek design would look equally at home in your office as it would in a gaming nook. And despite its unassuming appearance, the XPS Tower offers VR-ready gaming performance and a painlessly upgradable chassis that makes it ready for whatever hardware upgrades the future brings. If you want the XPS Tower’s performance and upgradability in a more exciting-looking package, there’s always the Alienware Aurora, and folks seeking a more living-room-friendly PC should consider the Asus ROG G20CB or the MSI Vortex. But if you’re shopping for a great gaming PC that doesn’t look like one, the XPS Tower will fit the bill.